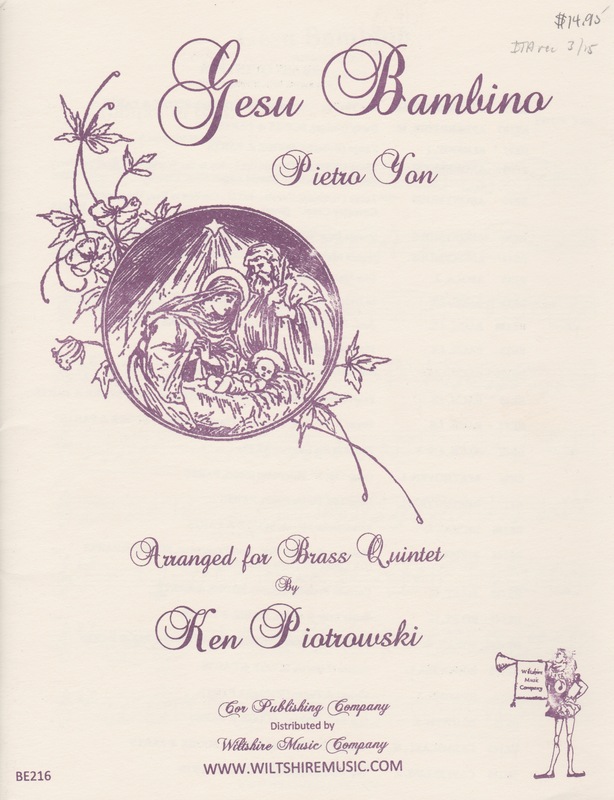 One hundred years ago, Italian-born composer and organist, Pietro Yon, took a portion of the popular Christmas carol “O Come, All Ye Faithful” and created an original composition, “Gesu Bambino,” which has remained a standard part of the holiday canon to this day. Maine-based composer Ken Piotrowski has arranged the work for brass quintet. After playing through the piece, I found it to be quite beautiful. Its melody and surrounding counterpoint transfer quite well to the medium of the brass quintet. However, the arrangement is not without its oddities. For a large part of the work, the second trumpet part is higher in tessitura than the first. This may not be trouble for a professional group but could be a problem for younger musicians. Additionally, there are at times chasms of space between the content of the tuba and the rest of the ensemble – up to two-and-a-half octaves. The tuba part itself has a range of almost four octaves, which is too wide for many younger tubists to perform with ease. It seems some simple octave displacements could have alleviated this issue. Also, an editing issue caused confusion on our first read-through, as the pickup measure, which is only one solo eighth-note in the horn part, is notated as an entire measure in the rest of the parts. While I appreciate the beauty of this work in the brass quintet setting, there are most likely other published arrangements more befitting for the ensemble.